Jonathan Davenport flashes under the checkered flag for a $12,000 win at Hagerstown. What won the race: Becoming the first repeat winner in 12 Lucas Oil Late Model Dirt Series events at Hagerstown Speedway, Jonathan Davenport of Blairsville, Ga., glided to a dominant flag-to-flag triumph worth $12,000 in Saturday night's 50-lap Stanley Schetrompf Classic. He raced largely unchallenged to his fifth victory of 2019 on the tour, beating Branond Sheppard by 2.497 seconds. On the move: Tim McCreadie of Watertown, N.Y., advanced from the 19th starting spot to finish fifth. Points chase: After Hagerstown: 1. Jonathan Davenport (2,110); 2. Earl Pearson Jr. (1,875); 3. Tyler Erb (1,850); 4. Devin Moran (1,730); 5. Josh Richards (1,670); 6. Tim McCreadie (1,650); 7. Jimmy Owens (1,620); 8. Don O’Neal (1,525); 9. Hudson O’Neal (1,510); 10. Kyle Bronson (1,450); 11. Billy Moyer Jr. (1,345); 12. Jason Jameson (1,325); 13. Shanon Buckingham (1,320); 14. Ryan King (1,310); 15. Stormy Scott (1,215); 16. Scott Bloomquist (1,185). Heat race winners: Jonathan Davenport, Jimmy Owens, Gene Knaub, Earl Pearson Jr.
HAGERSTOWN, Md. (April 13) — Jonathan Davenport’s $12,000 victory in Saturday night’s 50-lap Stanley Schetrompt Classic at Hagerstown Speedway was virtually a carbon copy of his win in the half-mile oval’s same Lucas Oil Late Model Dirt Series-sanctioned event last year — that is, a flag-to-flag triumph off the pole that wasn’t quite as dominating as it seemed. Indeed, Davenport faced nary a sustained challenge en route to his fifth win of 2019 and the 40th of his career on the Lucas Oil Series, but he certainly didn’t cruise care-free to the checkered flag. After a well-timed caution flag on lap 25 took him out of slower cars just as Jimmy Owens of Newport, Tenn., had drawn close to him, Davenport went on to lead the remainder of the uninterrupted distance without receiving any serious pressure. Nevertheless, Davenport was unable to rest easy even though he managed to cross the finish line with a final winning margin of 2.497 seconds over Brandon Sheppard of New Berlin, Ill.
Sheppard, 26, actually had to spend the final circuits holding on for dear life to preserve runner-up money over Owens, who ceded the second spot to Sheppard on the lap-25 restart and settled for a third-place result, about a half-second behind Sheppard. Fifth-starter Rick Eckert of York, Pa., was a few car lengths behind Owens in fourth at the finish in his self-owned machine while Tim McCreadie of Watertown, N.Y., was the race’s hard charger with his advance from the 19th starting spot to nab fifth, though his climbed no higher after cracking the top five on lap 28. Davenport and McCreadie drove Longhorn Race Cars, sandwiching the three XR1 Rocket mounts of Sheppard, Owens and Eckert in the final rundown. 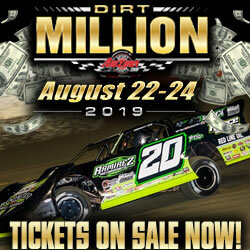 On his way to becoming the first repeat winner in 12 Lucas Oil Series events held at Hagerstown since 2006, Davenport realized just how important “clean air” can be for a driver circling the high-speed half-mile oval. Davenport built as much as a half-straightaway edge over Owens before his entrance into lapped traffic near the race’s midway point shrank that distance. What was on Davenport’s mind as he had Owens, as well as Sheppard and Eckert behind him, close up on him? “I thought I was definitely in trouble,” Davenport bottom-lined. Davenport breathed a sigh of relief when Jason Jameson of Lawrenceburg, Ind., slowed to a stop with a broken ball-joint to bring out a caution flag on lap 25. The second half of the race had its share of hairy moments for Davenport as well, including some difficulty putting Don O’Neal of Martinsville, Ind., down a lap. Davenport’s advantage didn’t dwindle down as much in the final laps as it had earlier, however, because Sheppard was unable to take advantage of the situation. “Once I got to second, J.D. was in the right line the whole time,” said Sheppard, who started 10th but hustled his Rocket Chassis house car up to third by lap 11 before surging past Owens for second on the lap-25 restart. “He had clean air, was in the right line and he did a really good job. I could never really get close to him. For Sheppard, though, the outing continued his torrid pace since he capped Georgia-Florida Speedweeks in February with four straight World of Outlaws Morton Buildings Late Model Series victories at Volusia Speedway Park in Barberville, Fla. With his run coming on top of a second-place finish to Owens in Thursday night’s Lucas Oil Series stop at Atomic Speedway in Alma, Ohio, Sheppard has seven wins and four runner-up placings in his last 11 starts on the WoO and Lucas Oil tours. “We had a really good car again tonight,” Sheppard said. “I’ve only raced here one other time and I wasn’t probably as good, but I didn’t think the track was as racy the last time either. This time I feel like the track was a little bit more racy and it was a lot of fun out there. For being a half-mile, big, slick place, not really much brown to chase, that was a lot of fun. Owens, 47, was also satisfied with a third-place finish to follow up his first Lucas Oil triumph of 2019 two days earlier at Atomic. The lap-25 caution for Jameson was the race’s second and final slowdown. Don O’Neal triggered the first caution on lap six when he stopped in turn four. The 54-year-old O’Neal pitted after bringing out the yellow flag and then pitted again during the lap-25 caution period. He continued racing following his second pit stop but was black-flagged and not scored anymore because Lucas Oil officials determined that he did not stop for an official at the end of pit road when he returned to the track, costing him one position in the final rundown; he was credited with a 24th-place finish rather than 23rd. Row 4: T. Erb, Moyer Jr.